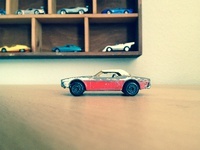 This is a rule of thumb estimate illustration of a Dodge Challenger, or the Dodge Challenger Matchbox Superfast from 1975, which I got from my dad when I was a little kid. I don't have kept many things from my childhood, but these matchbox/es really mean a lot to me... Attached you can see the actual matchbox,... it looks kinda "used" - and it is. My brother tried to "respray" the white parts of matchbox when he discovered some nail polish from our mom... after everything was a pink mess, we sanded the whole thing and ended up with this - let's call it - Wabi-Sabi approach of a toy. So yes, that's it, thank you for your time and attention, have a great day.